On an unseasonably warm day in March, we gathered in the library to build with Legos. Believe it or not, it felt good to get out of the hot sun for awhile! Miss Sarah supplied the theme--SPRING--and the children supplied the industrious creativity! Come on in to the Children's Room to see the results--they'll be on display until next month, when we'll deconstruct them and build a whole bunch of new creations! The next Lego-my-Library event will be during April vacation (Thursday, April 26). Registration is required, and begins on April 12. For more information, talk to Miss Sarah or Miss Sue at 673-2288 or shydorn@amherst.lib.nh.us. This month in the Children's Room, we're highlighting a selection of mysteries. We have everything from the classic Nate the Great, Nancy Drew, and the Hardy Boys to the newer A to Z Mysteries, the Sherlock Files series, and many wonderful individual titles. It's time to get in touch with your 'inner sleuth' ---come to the Children's Room and check out a mystery! 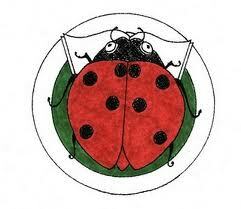 The Ladybug Picture Book Award committee has chosen the ten nominees for the 2012 Ladybug Picture Book Award. New Hampshire children, from preschool to third grade, will select the winning picture book when they vote in November 2012.